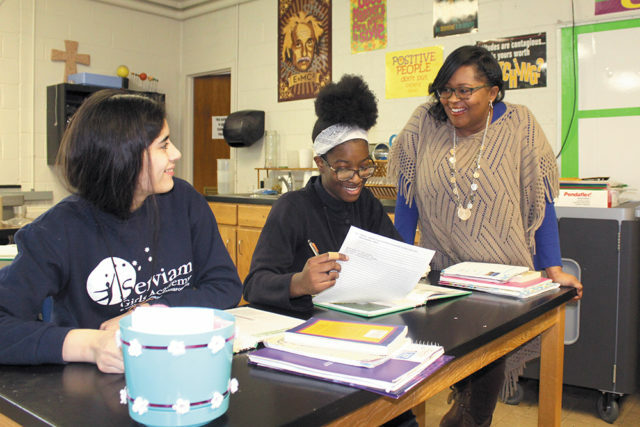 NEW CASTLE — Altina Herbert’s start as the principal at Serviam Girls Academy in New Castle got off to a delayed start, but it was for a good reason. She was on maternity leave after delivering her second child, daughter Maleah Renee. But since returning in October, Herbert’s focus during the school day — and often before and after — is the 60 girls who attend the tuition-free middle school that provides an educational opportunity that otherwise likely would not exist. And Herbert said it is a perfect fit for her. “What brought me here was … being able to teach in a school that had that balance, a balance of my passion for teaching but also my love for God. It made perfect sense to look for something that really aligned with the person I was,” she said. “The sense of community and seeing the girls when they come in on day one and seeing the progression to day whatever at the end of the school year. Seeing the growth in them is awesome,” she said. The school day begins at 7:25 and lasts until 5 p.m., with a variety of after-school activities designed to help the girls find their passion. Herbert’s day begins much earlier and ends later. She and her husband, Lee, are also the parents of a 3-year-old son, Mason, and she makes the 40-minute drive to and from Dover every day. She doesn’t mind the commute, however. It gives her an opportunity to digest the day and think, and also to make phone calls – safely, she stresses – if necessary. She said she and her husband like to travel and read, and they enjoy bath time with their children. Herbert also confesses to a love for owls and has seen them at Bombay Hook and other nature preserves in Delaware. “They’re fuzzy and they’re very smart. They sit back and are observant,” she said. Born in Florida, Herbert graduated from Smyrna High School and Delaware State University. She had her eye on education as long as she can remember, looking up to an aunt who was a teacher. “She’s my mentor. I’ve always had a passion for teaching. I would line my dolls up in my room, and I would teach them and read to them,” she said. She taught and directed several after-school programs before arriving at Serviam. Her last position, she said, was as the director of an early education center. “I live and breathe” kids, she said. Of course, going into administration takes the principal out of the classroom, something Herbert misses, but she occasionally gets to scratch that itch. She’ll fill in if a teacher is out or if she wants to spend some time with the girls. Interest in Serviam is as high as it’s ever been, she said. This is the school’s highest enrollment, and there is no shortage of interest in Serviam. That brings a smile to Herbert’s face. As the principal, she has to look at the entire school, and from a different perspective. She has spent the last few months observing what is happening in the classrooms and figuring out how that can be improved. Also, supervising teachers who were her equals not too long ago can be delicate, but Herbert goes back to the sense of community that pervades the school. She said the teachers have been supportive and are willing to be introduced to new ideas. She also has to consider a lot of different perspectives when making a decision and says it will be a learning process.